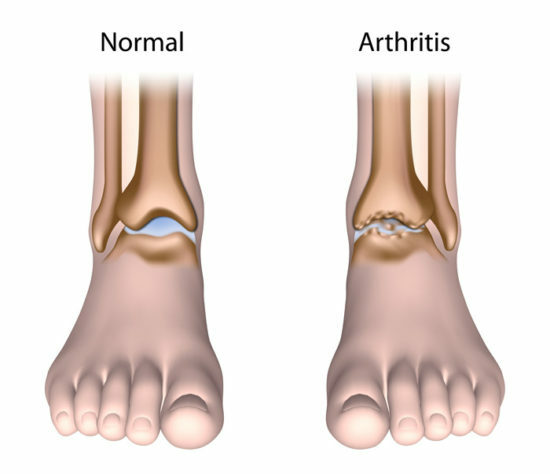 End-stage arthritis of the ankle joint affects more than 50,000 people in the US. When conservative treatments do not provide enough relief, surgical options should be considered. Patient selection is key when choosing between ankle arthrodesis (fusion) and total ankle arthroplasty (replacement). Compressive forces on the main ankle joint (the tibiotalar joint) can be 4 times body weight during normal walking. to bear the body’s weight and is injured more often than any other joint. For surgeons, the ankle is a dif cult joint, due to its small size and its complexity; once injured, it is hard to repair, especially in older people. AA uses screws, with or without plates and bone grafting, to fuse the articulating tibiotalar joint into a solid immovable bone. In some cases, the procedure may be carried out laparoscopically.13 Considered the gold standard of surgery to reduce pain for end-stage ankle arthritis,6,14,15 the procedure can lead to decreased ankle motion, altered gait, accelerated arthritis in surrounding joints, and nonunion.3,8,12 According to Peter G. Mangone, MD, foot and ankle orthopedic surgeon in Asheville, NC, and Co-Director of the EmergeOrtho: Blue Ridge Division Foot and Ankle Center, AA continues to be the treatment of choice for a number of patients (see “Patient selection,” below, for details). Likewise, Joel Morash, MD, PhD, a surgeon specializing in reconstructive foot and ankle surgery at Dalhousie University, Halifax, Nova Scotia, Canada, described AA as a useful procedure that should not be considered inferior to TAA, noting that some patients cope well postoperatively without significant gait changes. As TAA surgical technique and implant design have gained sophistication, the number of TAAs performed in the United States has risen—although the rate of AA continues to be about double that of AA.17, 18 Some specialist surgeons, such as W. Hodges Davis, MD, (foot and ankle surgeon and medical director, OrthoCarolina Foot and Ankle Institute, Charlotte, NC) and Steven Haddad, MD, (foot and ankle surgeon, Illinois Bone and Joint Institute, Glenview, Il, and Past President, American Orthopaedic Foot and Ankle Society) have seen their practices shift dramatically, with the rate of TAA significantly outweighing the rate of AA. This list includes devices designed specifically for revisions of primary TAAs. According to Mangone, the implant landscape is always changing, as there are constant improvements in implant design and growing experience as to which implants work best in which cases. Davis noted that, although the newest devices are limited to a short period of experience, their design is built on predecessor devices that have shown satisfactory outcomes and longevity. Chicago researchers compared AA and TAA outcomes published between 2006 and 2016 because they were concerned about lack of consensus about end-stage ankle arthritis treatment.8 They pooled results from 6 AA case series and 5 TAA case series (limited to those using 3rd-generation implants approved for marketing in the United States) and also assessed 10 studies comparing the 2 procedures. In all, data for more than 4000 ankles were used. 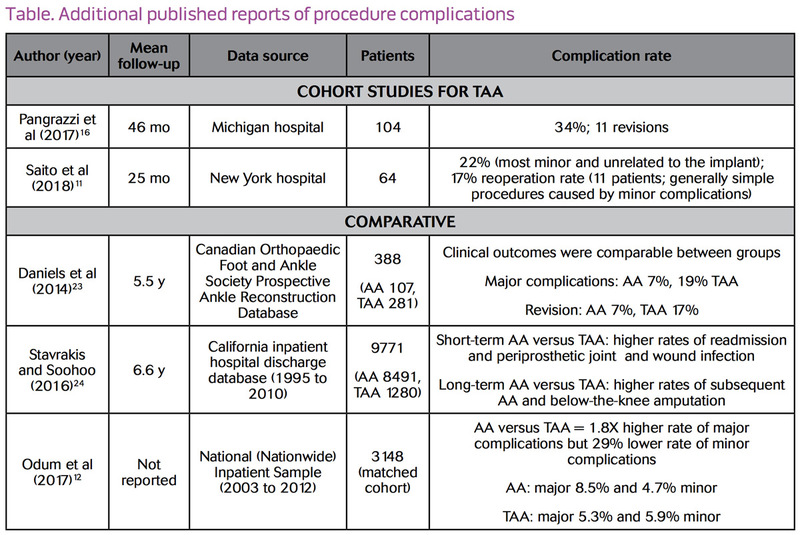 From the pooled case series, AA had a higher complication rate than TAA (27% and 20%, respectively) but a lower revision reoperation rate (5% and 8%, respectively). The most frequently reported AA complications were wound complication, nonunion, deep infection, and fracture; whereas for TAA, the main complications were device loosening, wound complication, fracture, and deep infection. Ultimately, the authors concluded that decisions should be made on an individual patient basis because significant advantages of one procedure over the other were unclear. A meta-analysis of 10 AA–TAA comparative studies was published by researchers the republic of Korea.22 They concluded that AA and TAA led to similar clinical outcomes, but that incidence rates of reoperation and major surgical complications were significantly increased in TAA—in particular, wound problems, perioperative fracture, and nerve injury. Other published reports of complications are detailed in the table. The longevity of TAA is less than that of hip or knee replacements, despite advances in techniques and implant design.6 Micro-motion of the implants may lead to lack of bone-implant integration; furthermore, even slight errors in positioning an implant can lead to failure.25 Ideally, a TAA can be revised but, if not, AA is the main option. According to Morash, converting TAA to AA is complicated; much depends on the state of the bones when the prosthesis pieces are removed. AA for failed TAA has a higher nonunion rate; patients must be aware that complications from these procedures may lead to amputation. A systematic review of 16 studies published from 1982 to 2012 (193 patients total) analyzed AA after failed TAA and found that most patients needed AA surgery due to TAA component loosening, usually of the talar component.18 The overall surgical complication rate was 18%, with a nonunion rate of 11%. Patient satisfaction rates were generally high. Morash noted that it is very important when converting an AA to TAA (called a fusion takedown) to ensure that the patient understands that the main goal of surgery is pain reduction, as range-of-motion will likely remain limited because the fused joint is accustomed to years of tissue restriction with the fusion in place. Conversion of AA to TAA is technically demanding and considered by some to be controversial.26,27 Davis pointed out the lack of published experience on the AA to TAA procedure means that long-term outcomes are unknown. Choice of treatment depends on a patient’s age, range of motion, level of activity, joint alignment, and expectations.11,15,20 Foot and ankle orthopedic surgeons Magone and Morash noted how important it is to 1) select the right patients for each procedure, and 2) ensure that patients (and providers caring for them) have a realistic understanding of what the surgical outcomes will be. lack of protective sensation or clear neuropathy patients with diabetes (due to the high likelihood of distal extremity neuropathy). As the American Orthopaedic Foot and Ankle Society’s Past President Haddad points out, patients must understand that an AA that fuses correctly is the only permanent solution to eliminating pain, although some will need future procedures to fuse adjacent joints that become arthritic due to increased stress. In contrast, the need for future surgery is very likely for those with a TAA, due to the realities of device longevity, particularly in younger people. Also, providers caring for patients with end-stage ankle arthritis who undergo surgery must have realistic goals. The main focus is to decrease pain and increase functionality somewhat, not to return to premorbidity function; however, patients often have realistic expectations because their presurgical function was so limiting for them. Patients must learn to take good care of their implants by avoiding aggressive sports and sudden-impact activities (e.g., basketball, skydiving, and horseback riding) and limiting themselves to activities in which ankle movement is controlled (e.g., hiking, golfing, cycling, and swimming). According to the orthopedic surgeons interviewed for this article, AA should not be seen as an inferior option, as it might, in fact, be the best option for many people. Magone said that he may initially uses AA in people in the 35 to 40-year-old range, then convert to a TAA when pain in adjacent joints surfaces some years later. Converting to TAA surgery can then avoid fusion of other ankle joints. The approach depends on the patient’s needs, activities, expectations, and foot flexibility. A 2015 Canadian analysis looked at teaching hospital costs (in 2006 Canadian dollars) for various alternatives, including operating room time, hospital stay, surgeon billing, and equipment used.4 The analysis concluded that AA is a less expensive and preferable alternative for some patient groups (e.g., young and active, diabetic, and with severe deformity) at $5500; however, TAA should not be denied based on device cost alone ($6420 in this analysis, compared to $1200 for AA) because the total in-hospital procedure cost of $13,500 was comparable to that of total hip arthroplasty and total knee arthroplasty. Also, TAA mean operating room time was longer, but mean hospital stay was shorter for the ankle procedures, compared with total hip arthroplasty and total knee arthroplasty. There are ongoing efforts to develop and market a satisfactory TAA device due to the drawbacks of AA,4 and the number of TAAs being performed is increasing as outcomes improve with newer bone-sparing implant designs and improved surgical techniques.9,25 In particular, early TAA devices have been replaced by 3rd- and 4th-generation devices made of advanced metal alloy and plastic that are engineered to interact with each other to maximize mobility and flexibility. Davis summarized his advice by saying that AA remains the optimal choice for some patients (e.g., those with arthritis isolated to the tibiotalar joint), but that this number is shrinking as new research shows the benefits of TAA with increasing implant and surgical sophistication. Overall, TAA advocates believe that, as TAA implants gain sophistication and spare more bone, and surgical techniques advance, the populations suited for TAA will continue to grow, although AA will likely always be the best choice for certain patient groups. Dr. Foerster is a freelance medical writer in Oxford Station, Ontario, Canada. Morash J, Walton DM, Glazebrook M. Ankle arthrodesis versus total ankle arthroplasty. Foot Ankle Clin. 2017;22(2):251-266. Courville XF, Hecht PJ, Tosteson AN. 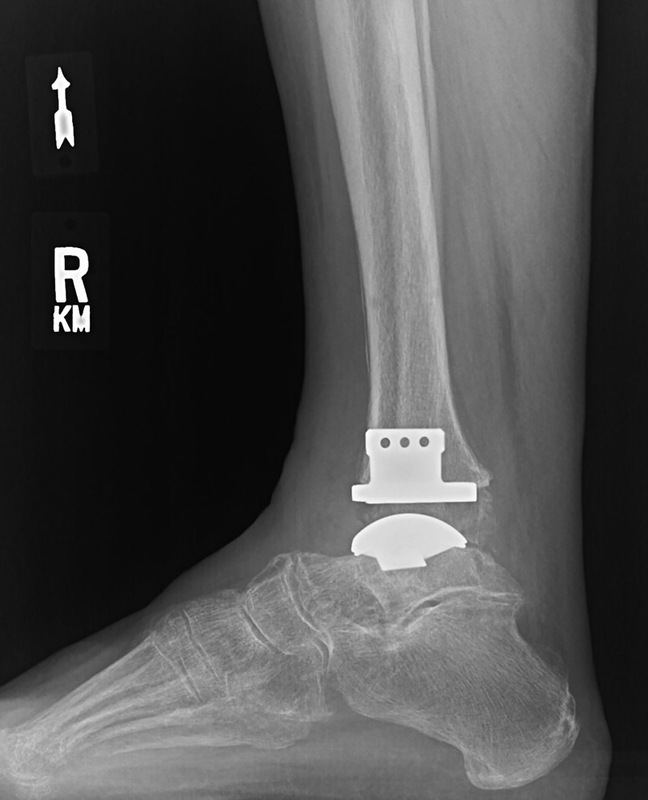 Is total ankle arthroplasty a cost-effective alternative to ankle fusion? Clin Orthop Relat Res. 2011;469(6):1721-1727. Baumhauer JF. Ankle arthrodesis versus ankle replacement for ankle arthritis. Clin Orthop Relat Res. 2013;471(8):2439-2442. Younger AS, MacLean S, Daniels TR, et al. Initial hospital related cost comparison of total ankle replacement and ankle fusion with hip and knee joint replacement. Foot Ankle Int. 2015;36(3):253-257. Pianin E. Ankle replacement was once disparaged as borderline quackery. No longer. The Washington Post. October 17, 2017.www.washingtonpost.com/national/health-science/ankle-replacement-was-once-disparaged-as-borderline-quackery-no-longer/2017/10/20/fb5db206-9e2a-11e7-8ea1-ed975285475e_story.html?noredirect=on&utm_term=.6bf802428903. Accessed June 19, 2018. Dujela MD, DeCarbo WT, Espinosa N, Weber JS, Larson DR, Hyer CF. Chapter 30: Evolution of total ankle replacement within the US. In: Update 2017. Decatur, GA: The Podiatry Institute; 2017:139-149. www.podiatryinstitute.com/pdfs/Update_2017/Chapter30_final.pdf. Accessed June 19, 2018. 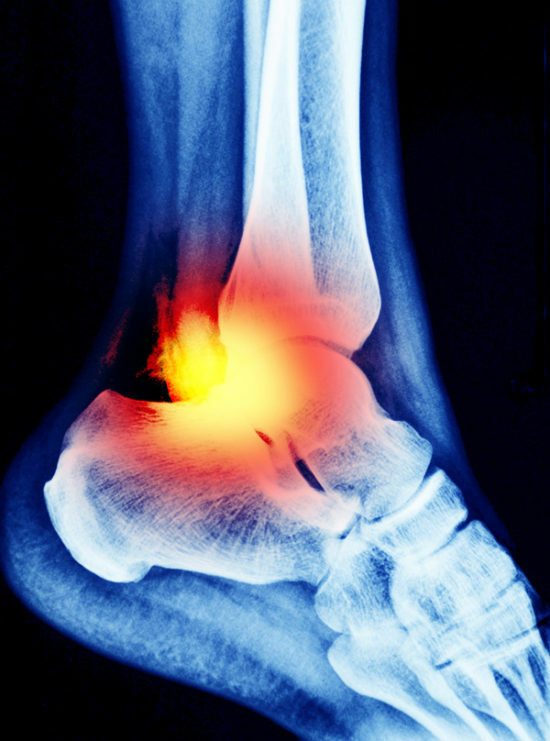 Weatherall JM, Mroczek K, McLaurin T, Ding B, Tejwani N. Post-traumatic ankle arthritis. Bull Hosp Jt Dis. 2013;71(1):104-112. Lawton CD, Butler BA, Dekker RG 2nd, Prescott A, Kadakia AR. Total ankle arthroplasty versus ankle arthrodesis-a comparison of outcomes over the last decade. J Orthop Surg Res. 2017;12(1):76-85. American Orthopaedic Foot & Ankle Society. FootCareMD: Total ankle arthroplasty. www.aofas.org/footcaremd/treatments/Pages/Total-Ankle-Arthroplasty.aspx. Accessed June 19, 2018. Centers for Advanced Orthopedics. Ankle arthritis and total ankle arthroplasty (replacement). www.footankledc.com/specialties/total-ankle-replacement. Accessed June 19, 2018. Odum SM, Van Doren BA, Anderson RB, Davis WH. In-hospital complications following ankle arthrodesis versus ankle arthroplasty: a matched cohort study. J Bone Joint Surg Am. 2017;99(17):1469-1475. Emory Healthcare. Ankle arthrodesis (fusion). www.emoryhealthcare.org/orthopedics/ankle-fusion.html?_ga=2.79960791.1791773472.1524860863-1841104690.1524860863. Accessed June 19, 2018. Pappas MJ, Buechel FF. Failure modes of current total ankle replacement systems. Clin Podiatr Med Surg. 2013;30(2):123-143. Hsu AR, Haddad SL. Will total ankle arthroplasty become the new standard for end-stage ankle arthritis? Orthopedics. 2014;37(4):221-223. Pangrazzi GJ, Baker EA, Shaheen PJ, Okeagu CN, Fortin PT. Single-surgeon experience and complications of a fixed-bearing total ankle arthroplasty. Foot Ankle Int. 2018;39(1):46-58. Terrell RD, Montgomery SR, Pannell WC, et al. Comparison of practice patterns in total ankle replacement and ankle fusion in the United States. Foot Ankle Int. 2013;34(11):1486-1492. Gross C, Erickson BJ, Adams SB, Parekh SG. Ankle arthrodesis after failed total ankle replacement: a systematic review of the literature. Foot Ankle Spec. 2015;8(2):143-151. Coetzee JC, Deorio JK. Total ankle replacement systems available in the United States. Instr Course Lect. 2010;59:367-374. Bowman KD. Ankle fusion or ankle replacement? Choosing the right ankle surgery. Duke Health Blog. November 1, 2016 www.dukehealth.org/blog/ankle-fusion-or-ankle-replacement. Accessed June 19, 2018. Emory Healthcare. Total ankle replacement surgery. www.emoryhealthcare.org/orthopedics/ankle-replacement.html. Accessed June 19, 2018. Kim HJ, Suh DH, Yang JH, et al. Total ankle arthroplasty versus ankle arthrodesis for the treatment of end-stage ankle arthritis: a meta-analysis of comparative studies. Int Orthop. 2017;41(1):101-109. Daniels TR, Younger AS, Penner M, et al. Intermediate-term results of total ankle replacement and ankle arthrodesis: a COFAS multicenter study. J Bone Joint Surg Am. 2014;96(2):135-142. Stavrakis AI, SooHoo NF. Trends in complication rates following ankle arthrodesis and total ankle replacement. J Bone Joint Surg Am. 2016;98(17):1453-1458. Sopher RS, Amis AA, Calder JD, Jeffers JRT. Total ankle replacement design and positioning affect implant-bone micromotion and bone strains. Med Eng Phys. 2017;42:80-90. Pellegrini MJ, Schiff AP, Adams SB Jr, et al. 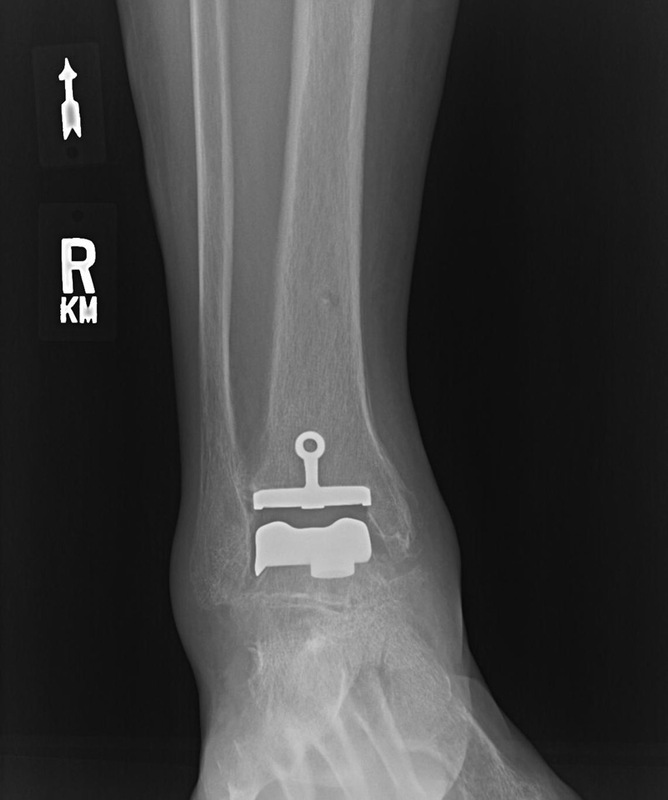 Conversion of tibiotalar arthrodesis to total ankle arthroplasty. J Bone Joint Surg Am. 2015;97(24):2004-2013. Preis M, Bailey T, Marchand LS, Barg A. Can a three-component prosthesis be used for conversion of painful ankle arthrodesis to total ankle replacement? Clin Orthop Relat Res. 2017;475(9):2283-2294. Huntington WP, Davis WH, Anderson R. Total ankle arthroplasty for the treatment of symptomatic nonunion following tibiotalar fusion. Foot Ankle Spec. 2016;9(4):330-335. SooHoo NF, Kominski G. Cost-effectiveness analysis of total ankle arthroplasty. J Bone Joint Surg Am. 2004;86-A(11):2446-2455.